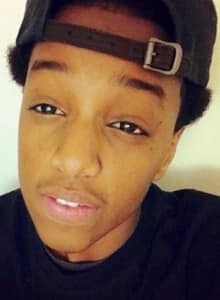 Yusuf Tifow, 16, was fatally wounded during a shooting that occurred late Sunday. Toronto police went to an apartment building at 2240 Weston Rd., after they received a call about a shooting shortly before midnight. Tifow was found without vital signs in an apartment on the 19th floor. Police say he was then rushed to hospital, where he was pronounced dead. On Monday, police stood guard in front of the apartment where Tifow was found. Police are reviewing footage from security cameras inside the building. They have said it is possible that a suspect could have been captured on recorded video. A post-mortem examination is being scheduled. The slain teenager did not live in the building where he was shot, but at an apartment building on the other side of the Humber River. Family friend Zahra Abdirizak said that Tifow came from a family of five sons. Abdirizak said she remembered when Tifow was born. She said it was hard to know what the slain boy's mother was going through. "He's a good kid," she told CBC News on Monday. Said Dirie said he had also known Tifow since he was born. "He was a very bright kid, he was good," he said. Dirie said Tifow's parents came from Somalia, but their children were all born in Canada. Tahj Loor Walters, 15, who died Aug. 13 after suffering multiple gunshot wounds in a July 28 altercation at Yorkwoods Gate Plaza. O'She Doyles-Whyte, 16, who was gunned down outside a north Toronto housing complex on Aug. 23. Kwame Duodo, 15, who was killed in the same incident that claimed Doyles-Whyte's life. That tragic spate of violence has left many people demanding answers as to what is happening. Police have said that gang members are at the centre of a recent spike in gun violence, which includes the ongoing shootings in northwest Toronto.